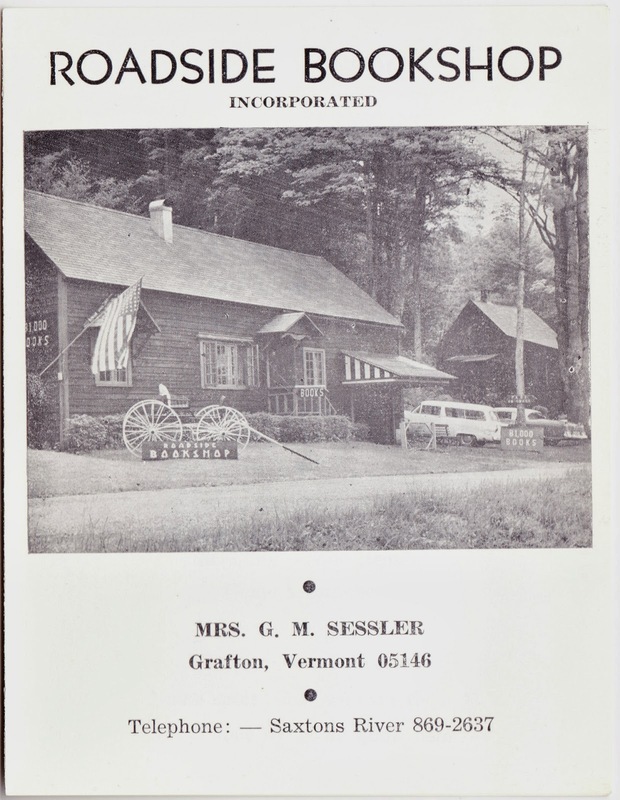 Here's a classy, four-page brochure for Roadside Bookshop in tiny Grafton, Vermont1, which was operated by Mrs. G.M. Sessler. Based on some other papers that were in an envelope along with this brochure, I think it dates to the sometime between 1965 and 1968. According to the inside of the brochure, the cozy-looking bookstore offered rare, interesting and out-of-print books. It described itself as "a haven for lovers of books" with "a diversity of fascinating material including unique items." The store was located "in a beautiful spot on Routes 121 and 35 on the banks of the Saxtons River," about 2½ miles east of Grafton. "A browser's delight is found at the Roadside Bookshop located about three miles east of Grafton on Route 121. Here, Dr. and Mrs. Jacob J. Sessler offer at least 100,000 volumes (the sign says 81,000, but that's what they started with in 1949). There are special sections for Vermontiana and children's books, and a bargain basement shelf." I can tell you exactly what happened to Roadside Bookshop, thanks to the Fall 1976 issue of Sangamon, the alumni magazine of Sangamon State University, which is now the University of Illinois at Springfield. "From the outset is was the goal to build strong collections and to establish the library as a key element in the university's development. But, if the new institution required a strong library, how were we to assemble it? Clearly we needed many publications which were long out of print. We could go to the corner bookstore, or book wholesalers, or publishers for these items. They would have to be found in countless bookstores which specialized in the resale of used and out-of-print titles. And, in fact, many purchases were made this way. "There was, however, one extraordinary purchase. 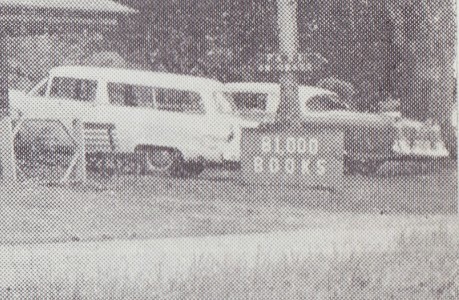 In June, 1970, President Spencer stopped to make a small purchase at the Roadside Bookshop in Grafton, Vt. He made his purchase, but also came away with word that the owners wished to sell out their entire stock of more than 100,000 books. When I learned of this prospect I hurried to Grafton with my new colleague, Katherine Armitage, and we spent a day poking into every corner of the barn which was the store. That evening we concluded our bargain with the owners, and in August five moving vans filled with books to be sorted and cataloged arrived in Springfield. This purchase gave the new university library an excellent beginning in American and British history, political science and literature." I think that's a pretty happy ending, don't you? 1. I love historical tidbits like this one about Grafton on Wikipedia: "The town was founded as Thomlinson, but renaming rights were auctioned in 1791. The high bidder, who reportedly offered 'five dollars and a jug of rum,' changed the name to Grafton after his home town of Grafton, Massachusetts. Possibly as a result of having celebrated a bit too much with the rum (some say it was hard cider), the money was never collected."